Rising above the site of an old inn is One Valhalla, a mixed-use residential community, featuring pedestrian-friendly landscapes and a beautiful urban setting located in the heart of Etobicoke. The upscale glass-clad towers and modern townhomes front onto an elegant courtyard designed to be the central square of the community. 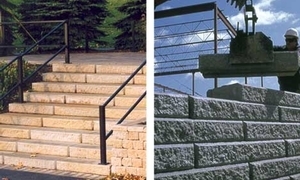 SienaStone® was used to create the retaining walls, raised planters and steps along the wide, landscaped pathways. And perfect for pedestrian applications, Hollandstone™ was chosen for the paved courtyard due to its classic shape and flexibility in design, creating a spectacular space for all residents of the community to enjoy.